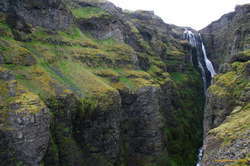 Destinations: Glymur, the highest waterfall in iceland, Hraunfossar, where water seeps out underneath a lavabed, making one of the widest waterfalls I've seen, and Bjarnafoss, just upstream, a waterfall from legends. We didn't get the best weather, after nearly two weeks of stellar weather,it finally broke, and we headed out under grey skies and spitting rain. It's currently raining quite heavily, about as heavy as I've seen since I moved here. Fortunately we missed that! Pulled into the carpark at Glymur as car number 2, this is what we get for meeting at 9am. "followed" the "track" off across the hillside. Right from the carpark you can either go over a stile north, or through a gate east, and there's just a maze of tracks. This section is actually quite well marked with yellow painted rocks though really. Lonely planet says about an hour out the flat, then up some steep hills for half an hour or so. Seems about right. Maybe more like 45/45 depending on how high up the hills you go. Here was where it started to get interesting quickly. 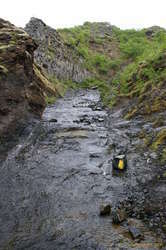 The track leads you to a cliff edge, with a track that starts heading down the scree. Hey presto. You don't slide down the scree at all! There's a cave and tunnel system that goes back under the cliff almost straight away, but not obvious from the top. It's also obvious from here that this bit of landscape is not what it seemed from down the valley at all. There's a great big canyon upstream from you, presumably with the waterfall at the head of it. 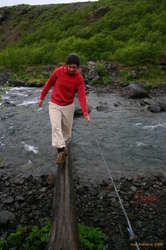 Then it's a log bridge with a steel cable handline, and then up a watercourse and scrambling up some muddy slopes on the far side. Then you just follow your nose. Lots of tracks. Lots and lots of tracks. Sometimes we were on good tracks, sometimes not so good, and looking at better ones we'd missed. The waterfall comes into sight. Wow! And whoever was in charge of landscaping around here did a stellar job. There's a whole string of absolutely superb natural lookouts on the cliff edges as you go up. The gorge is full of birds swooping around and is lush and green. We saw some guys on the far side of the gorge coming down, and thought it might be possible to go up and around the head of the falls. We followed tracks up to the top, and walked back into the hinterland for a bit to see if we could find a crossing, but it looked like we'd need to wade the river, which wasn't looking very appealing. So down again down again, following a completely different set of tracks. By now there was half a dozen cars in the carpark, so after some tea and cake, we headed off for Hraunfossar, via reykholt and the backroads. 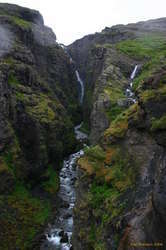 Arrive at Hraunfossar, back into traditional Icelandic tourist destinations. Drive right up to it. None of this walking for an hour across the lava. Still totally worth it though. 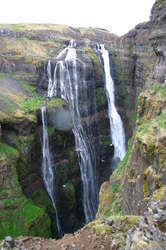 The Hvitá is a delicous glacial blue colour, flowing past the continual waterfalls seeping out of the lava. It's certainly not your everday waterfall. I'll let the pictures describe it further. 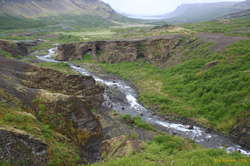 Just upstream is Bjarnafoss. 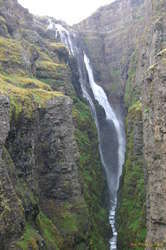 This is a big boiling tumbling cascade on the Hvitá itself. According to legend, there used to be a rock arch across the river here, but after two children fell off and were drowned, the mother had the arch destroyed. There's still arches in the rock around waterline today, so it's not hard to believe. Then off up to head of the valley, admired the clouds around Eríksjökull, and the huge expanse of Langjökull. 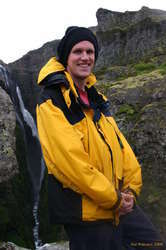 Late lunch sitting on soft moss on the lavafields, hot coffee at Borgarnes, and then through the tunnel and... traffic! Stop start traffic all the way back to Mosfellsbaer! It was the end of a long weekend, and there was an accident, but this was still most unusual! All in all, a lovely day. It was great to have company along, too. Made for a much more enjoyable trip.